This site contains information on over 250 herbs, vitamins, and other dietary supplements commonly used by consumers. It includes what symptoms the supplement is used for as well as safety and drug interaction information. It rates effectiveness based on evidence and according to the Natural Medicines Comprehensive Database scale. The list of herbs also contains links to the NCCAM Herbs at a Glance fact sheets for quick access. 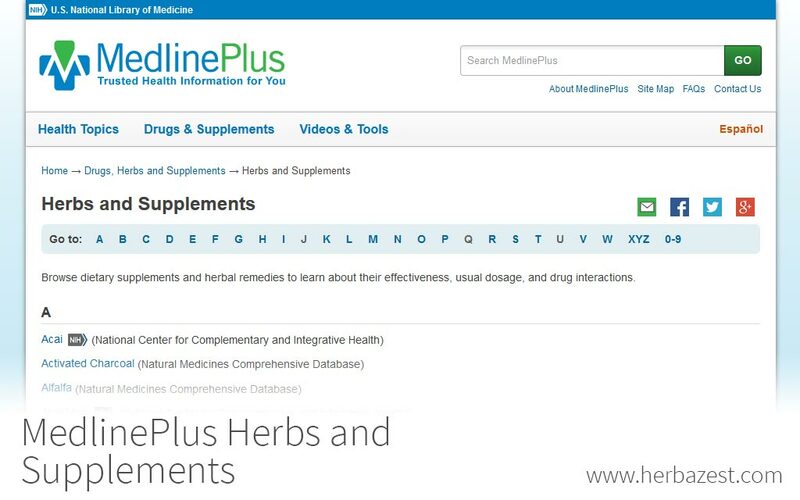 MedlinePlus Herbs and Supplements is part of the MedlinePlus compendium, provided by the National Institutes of Health. MedlinePlus is a resource for patients and consumers written in clear, understandable language and focusing on the most relevant details. It features pages on nearly 1,000 health topics in both English and Spanish.